Have you heard about a special form of writing Arabic, called the Arabic Chat Alphabet? It's used mostly by young people across the Arabic world, and I used it myself to learn to speak Egyptian Arabic. The Arabic chat alphabet (alternatively the Franco-Arabic alphabet, or ‘Arabizi' عربيزي), it's an alternative to the standard written Arabic that uses the Latin script. It's an interesting product of the online generation. The reason for its evolution, was that when computers and mobile phones first began to spread, it was only possible to write in the Latin script. People started to look for ways to communicate in Arabic using the Latin script, and the Arabic chat alphabet was born. Even now, with the spread of smartphones, where writing the traditional Arabic script is easy, many young people still prefer to write in this new way, because it allows you to keep the phone in English, and you can keep the writing setting from left-to-right (standard Arabic is written right-to-left). I asked an Egyptian colleague in my office about it, and she wrote out the following diagram. The Arabic chat alphabet uses the Latin script to spell out words phonetically, with the special addition of 7 numbers, which represent those Arabic characters not found in English. In the photo above, the special numbers are in the first column, with the Arabic letter they replace given in the second column. For example, the number “3” represents “ع” (ʿayn). You can see the similarity in the shape of the letter! 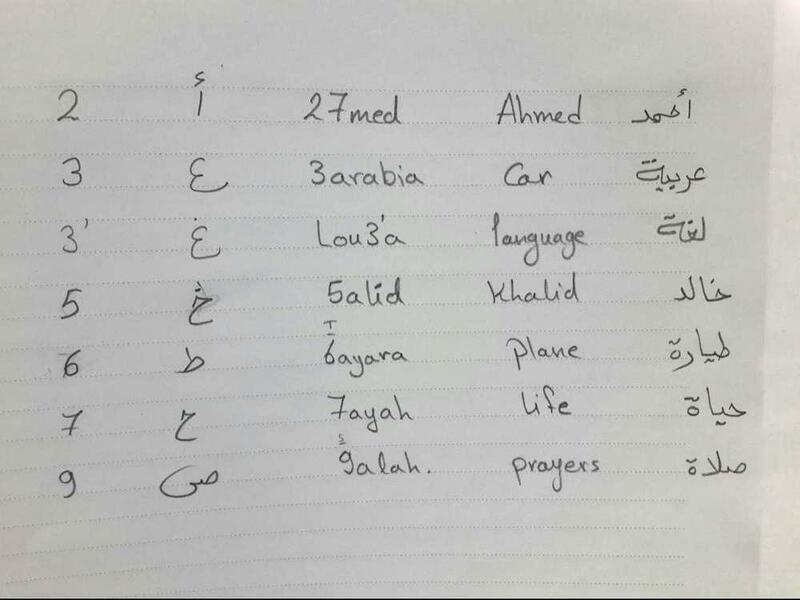 So, to write the word “عـَر َبـِيـَة” in Franco-Arabic, you'd write it like this: “3arabia”, as you can see in the 3rd column. Since there are only 7 numbers to learn, I hope to be able to memorise this pretty quickly. For myself, I originally thought that I will probably avoid writing like this for now. The simple reason was that in order to learn the traditional Arabic alphabet properly, I think it's important to be completely immersed in it for a while. However, 1 week later, I'm already using it to write everything – it's too convenient! I'm already writing out all my flashcards using it! I said before that I think it's really important to learn the traditional Arabic alphabet, and I still think that. But since this month is dedicated to speaking as much as possible, I think I'll put it off until I arrive in Cairo in September. Click here to watch an interview with me in the streets of Cairo! Do you know someone that would benefit from this article? Please share it on Facebook or Twitter to let them know! To follow my progress in Egyptian Arabic and get more updates like this, just sign up below!